2/ according to a blog post, the $15M will be used to fund the next 3 years of operating costs. i'm sure people think this is a great sign for the project - being able to recruit high quality capital. but, i think this is a massive failure in governance and project management. instead, a team decided to sell a large portion of tokens to one single investor without consulting other $MKR holders or communicating with their community. so where did this 6% come from? 5/ while i appreciate projects need capital to operate, selling development funds to raise capital at a discount to the public market price seems like an over-reach for a foundation. this process should have been conducted in a transparent manner, instead of behind closed doors. 6/ going back to @1confirmation / @thecontrolblog post from February - transparency is a big part of the value prop for this project. 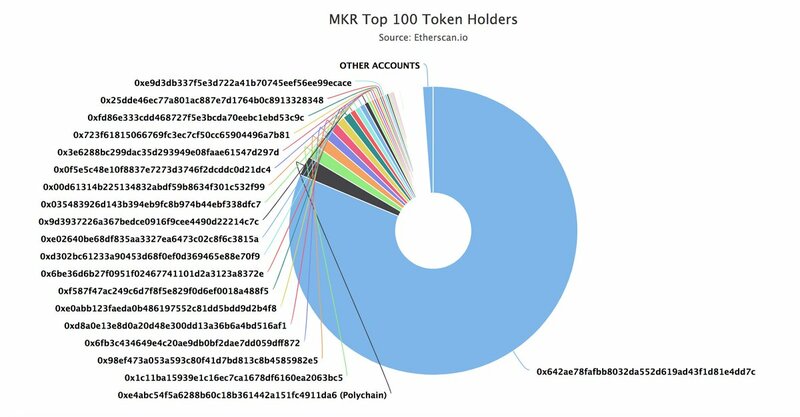 apparently "holders [will] be increasingly empowered over time...voting on all major decisions"
7/ currently, most $MKR are still locked by the team, and will be distributed to MKR ecosystem participants over time. i believe @polychaincap will ultimately own 15%, and are one of few investors to have received $MKR to utilize. 8/ and according to this @MessariCrypto tearsheet (disclosure: i'm an investor) - A16Z already investing in $MKR back in December. is anyone else slightly confused here?